The image above is compressed. The printed image and scripture will be very clear. Blessings to you, and thank you for visiting my gallery! 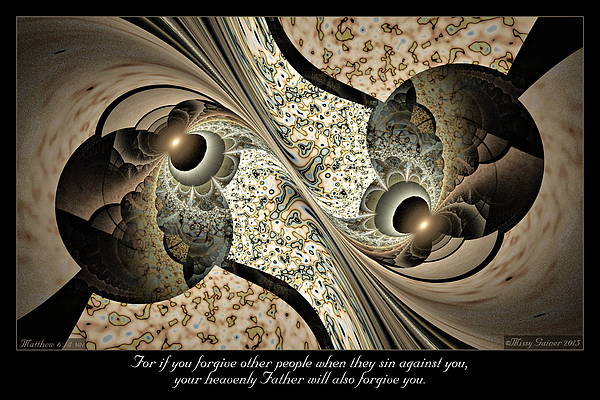 For if you forgive other people when they sin against you, your heavenly Father will also forgive you. 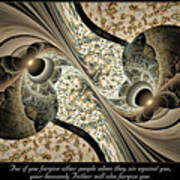 Matthew 6:14 NIV Thank you for viewing my artwork. I create my fractals to spread Gods word in a beautiful way. 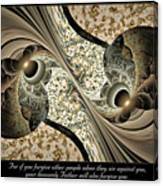 All artwork is designed for small to large poster size prints. Please enjoy. Artwork Copyright Missy Gainer 2015. All rights reserved worldwide. THE HOLY BIBLE, NEW INTERNATIONAL VERSION, NIV Copyright 1973, 1978, 1984, 2011 by Biblica, Inc. Used by permission. All rights reserved worldwide.